A couple in Ogun State, 46-year-old Abiola Wahab and Toyin Abiola, were said to have been on the run for a long time until nemesis caught up with the duo in Obatoko, Ogun State and they were arrested. They are now cooling their heels in the custody of the Special Armed Robbery Squad (SARS) of the Ogun State Police Command, where they are undergoing interrogation. 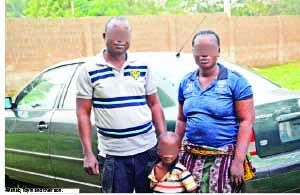 The couple was alleged to have serially used their three-year-old son, an innocent toddler, as collateral to defraud a long list of victims, from whom they borrowed money or bought goods on credit, which they sold and never paid the creditors. The Commissioner of Police, Mr. Ahmed Illiyasu told Sunday Sun that the husband and wife allegedly defrauded large-scale distributors of goods. Giving insight to the modus operandi of the duo, he said that they would visit a distributor, collect goods worth millions of naira, pay in some money and then disappear and never return to settle the debt. He said the couple had duped victims in Oyo, Lagos, Osun and Ogun states. To facilitate their operation and avoid detection, the police commissioner said that the couple always switched the number plate on their vehicle, which they drove to the business premises of their victims. This way, they were able to make it impossible for the victim who may have copied the vehicle number to trace them. Illiyasu added that the command had been receiving several complaints about a couple that was duping major distributors and deceitfully taking goods from them on credit but never returning to pay. The commander of SARS, Supol Uba Adams revealed that the couple was nabbed in a home they built in Ikire, Osun State. When she spoke with Sunday Sun at the headquarters of SARS, Toyin disclosed that prior to her getting involved in the fraudulent act alleged against her, she had been engaged in distribution of rice. “Life was so difficult for us, the family of my husband and my own family assisted us and gave us N770,000 naira. We used the money to buy a car in Apapa in 2013. My husband and myself started trading in rice again. We would go to Saki to buy rice and resell. One day, a Customs officer duped us. Also speaking, her husband disclosed that he married Toyin 11 years ago and they had faced difficulties in the course of the marriage. During their alleged fraudulent activities, he told Sunday Sun that they often took along their three-year-old son and pretended that he was sick. “We used our three-year-old son as collateral in the deal and pretend that he was not feeling well,” Wahab said. The unfortunate victims would because of the ill-health of the toddler show pity on the couple and allow them to go away with goods while temporarily leaving behind the supposedly sick child in the care of the victim, with the promise that they would come back to collect him and pay for the goods. Craftily, the wife would come back to take the child and disappear. The couple’s cookie crumbled when they were perfecting arrangements for another duping expedition. As they were relaxing in the comfort of their home, SARS operatives who had been on their trail swooped on them and their child and arrested them. Following their confessions during interrogation, the detectives invited some of the victims, who positively identified the duo, who the police commissioner assured would be charged to court soon.